Hazel and I tried out the new Epson Eco Tank and we found it inspired us to make a’ little box of history’. To be honest, when I was sent the Epson EcoTank Expression Premium ET-7750 I was fairly sceptical. I usually use an Epson SureColour P5070: an incredible printer that prints the most beautiful fine-art photos for my clients. Of course, such high-quality prints cost more in the ink department, so I don’t often use it to print out my own everyday photos — only a select few for displaying on the walls. My first thought was that since I already have this amazing printer, I don’t really have use for another. Boy, was I wrong. I am your textbook ‘mumtographer’: I take countless photos of my children but do nothing with them. Printing my own family photos and making albums always seems to get pushed to the bottom of the list. Just the thought of doing this was daunting; finding the time to sort through years of phone photos, transferring them onto a USB stick to take to one of those kiosks at the mall … ugh. It very quickly became a chore. Something that should have brought me excitement and joy instead left me feeling unmotivated and guilty for never making the time to preserve my family’s precious memories. 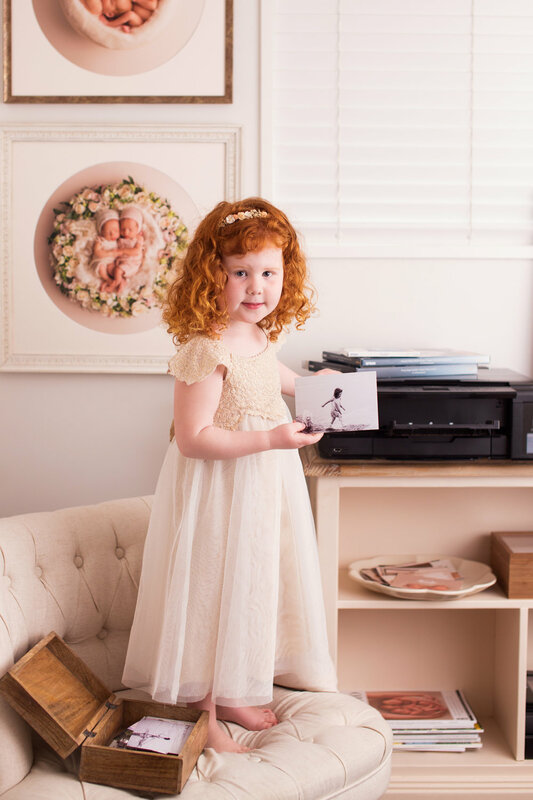 When the printer arrived, my three-year-old daughter, Hazel, instantly claimed it as her own and declared, “I want to print photos, Mummy.” Her enthusiasm finally ignited my own, and, with the Epson EcoTank, we were able to start our little box of history right then and there. The inspiration for this box lay in two distinct childhood memories I have of printed photos, and the hope that I could create similarly moving experiences for my children. The first memory is of excitement; of filling up my disposable camera and then finally getting the prints back from the pharmacy not knowing what was going to come out. Even the memory of shuffling through those photos for the first time gives me warm fuzzies. Looking at them now, they are a real insight into how I saw the world as a child. The second memory is of awe; of going to my grandparents’ house and carefully rifling through an old wooden box filled to the brim with loose prints. Even then, these images were a priceless documentation of the history of my father and his family. The feeling of holding these moments from lives past, which could otherwise be long forgotten, in my hands is indescribable. I recently found myself in this position again when sorting through my grandfather’s old photos after he passed away. I came across an image almost a century old, yet in amazing condition — my dear grandad, aged two. It wasn’t a professional portrait; it was simply him sitting outside his family home, taken by his mum. 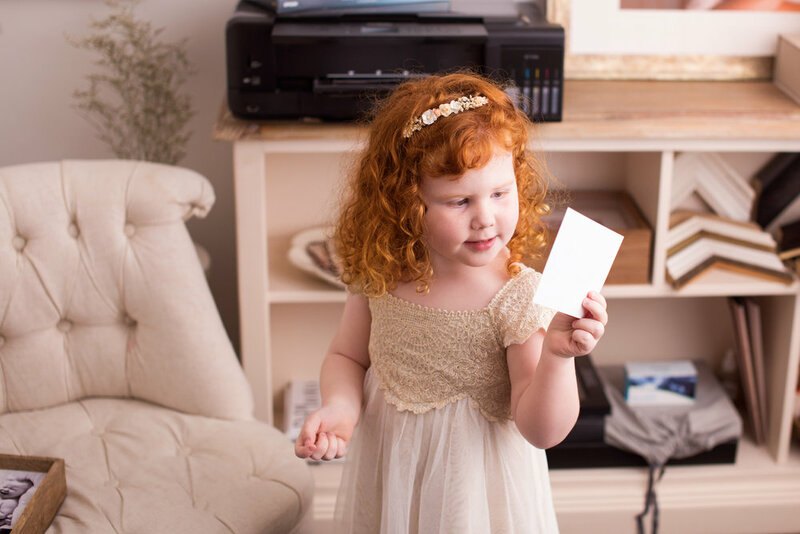 So far, Hazel and I have printed out hundreds of our own 6x4” glossy memories, including out-takes from photo shoots, and everyday phone photos from the last three years, captured by myself, Hazel, and my husband. Incredibly, 360 photos did not even make a dent in our ink supply. 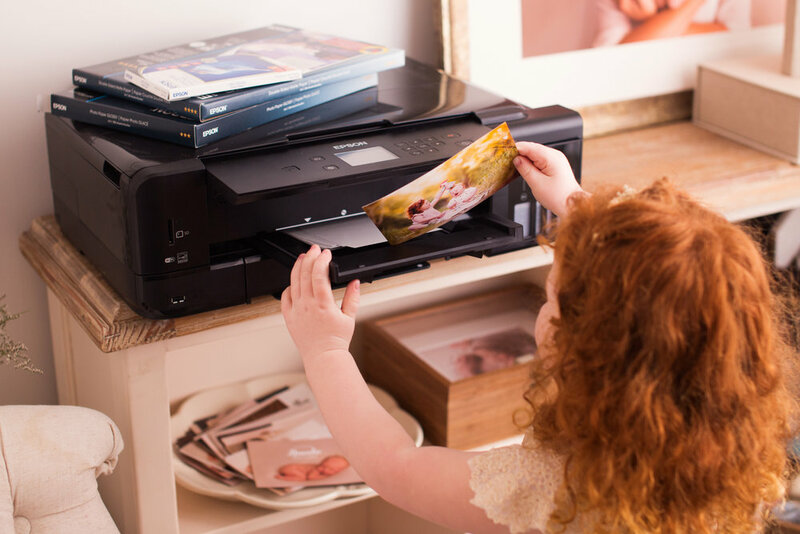 The Epson EcoTank makes it incredibly quick and effortless, allowing me to send images straight from my phone to the printer. Within minutes, images were printed and added to our box. I was even inspired to write dates and memories on the back of some prints like my grandparents used to do. Knowing that those simple, everyday moments that are so easily lost can now be physically held, protected, and remembered is incredibly comforting. No longer will these moments be forgotten about in some ‘cloud’ but instead, stored in a special place in our home, ready and waiting to be shuffled, passed around, and laughed over, as I did with grandparents as a child. I can’t wait to see the kids, in the years and decades to come, holding these memories in their hands, corners bent, worn and torn … but well loved. Perhaps they’ll even have their own additions to our little box of history. It comes with 2 years of ink! The first of my 'Trio' of blogs about the O'Leary Triplets. Introducing Macy, Toby and Sadie. (Although I’m sure you know who they are by now). I was fortunate enough to photograph these little red-headed treasures at the brand new age of 31 days. Once it was confirmed these guys would be visiting my studio my brain started buzzing with ideas on how to make this session extra special. 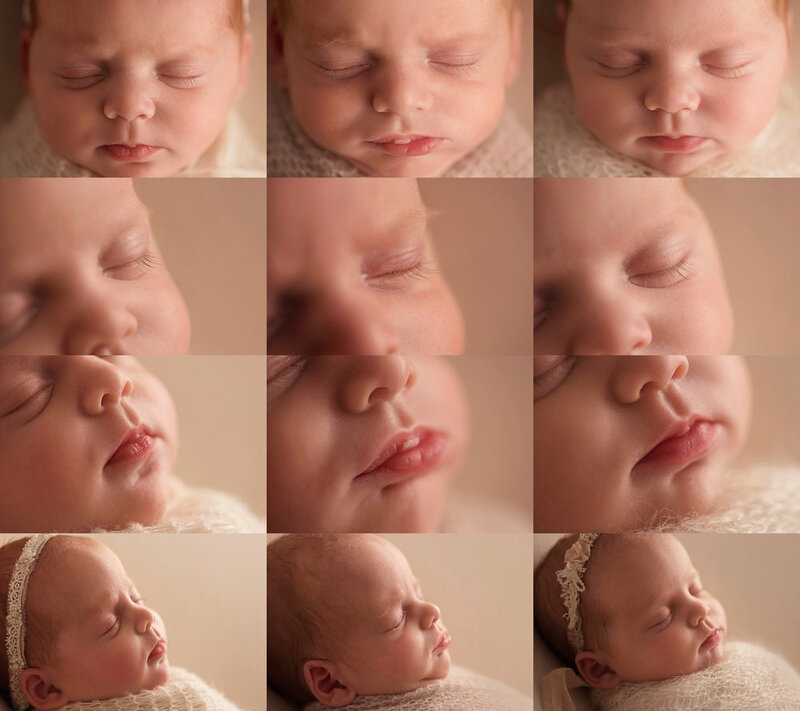 I decided to hire Emma Smart to video the session for me, not only as a beautiful keepsake for the family, but I thought my clients would love to see a behind-the-scenes video in the studio. The week before the session our mission to find hundreds of succulents began. We found lots in corners of random parks and friends’ gardens. After two days of urban foraging Maddy gathered them all together and washed every single one delicately so that they stayed in one piece. The day before the photoshoot Maddy and I realised we had no idea how to make a twig wreath, so we decided to just wing it. We found some bendy twigs and put them all together. It was 11pm the night before the shoot and we were out in the middle of a park, in the dark, collecting more twigs as we decided it wasn’t big enough. The day of the shoot came. And we were very excited. We were about to see our hard work and planning on the succulent wreath come to fruition with three little babies in the middle of it. I have photographed triplets before but I will never forget that feeling when the three little capsules arrived at the studio door. Excited, while hoping my plans for the session would all work out. I found once I had each of these babies on my knee to swaddle them, I could study their little faces, and they felt very familiar. The porcelain skin and the sprinkling of red hair and little blonde eyelashes reminded me of my own babies at this age. Yes... cue my mummy hormones. I planned only three set ups for this session but it was at this point in the session my hormones kicked in and I went a bit off track and just winged it. 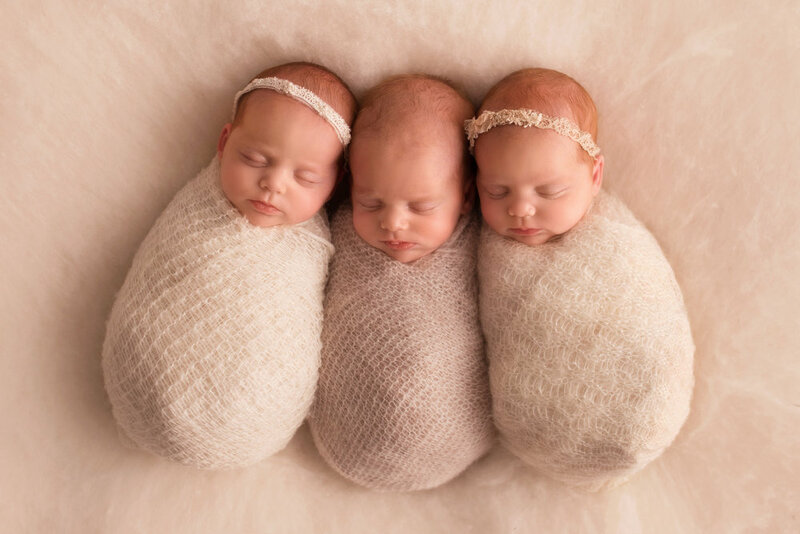 I thought, If these were my babies, how would I photograph them? 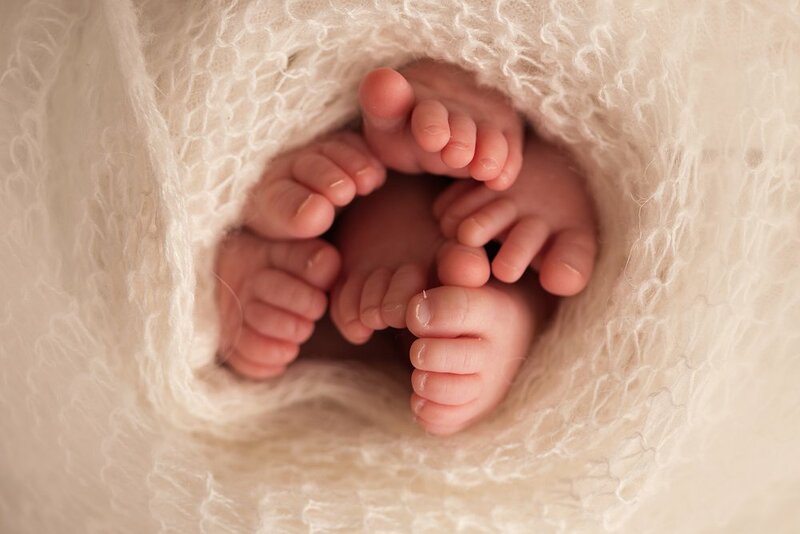 These tiny humans who shared a womb just 31 days ago, three siblings who found comfort in each others touch. So I decided to document this, I found that when they were naked they loved being snuggled up right beside each other. When I would take one away they would all stir and instantly settle once back in each other’s arms as a complete little trio. If this is how full her hands are, imagine her heart. This photo below was on my 'dream' list to get. This photo took around 45 minutes to one hour to set up. You most probably have already seen this video. But Emma Smart did a wonderful job at capturing the behind the scenes action! This video features Maddy and I working our magic with the triplets. With all the attention around this video I have been getting a lot of comments that I must be booked out. But I still have space available, so get in touch if you would love a photoshoot with me. Including trips and tricks to approaching a session with multiple babies. Also handy information to answer all the questions I have had about my prop vendors featured in this session and that technical mumbo jumbo.